Hello Lovelies! Happy Thursday. I’ve been using the Simple Eye Make-Up Remover Pads for a couple of weeks now. Are you super curious what I thought of these? 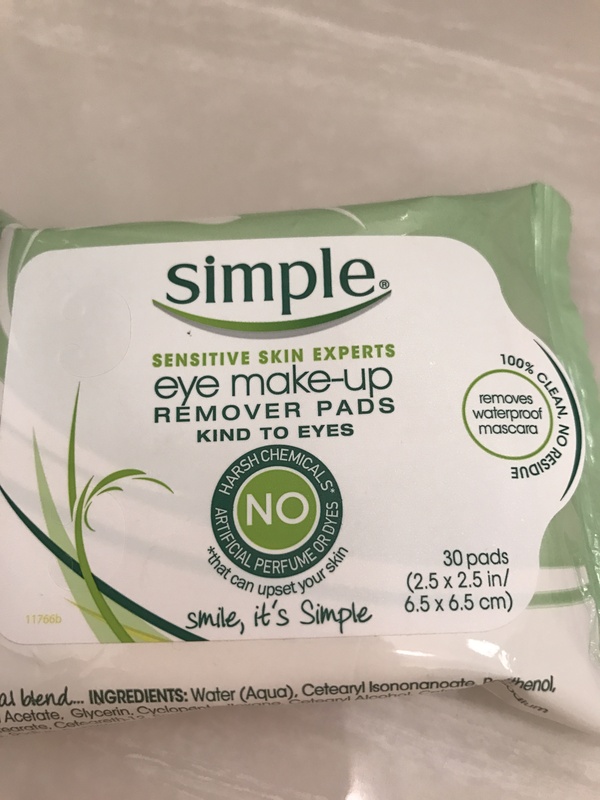 Simple Eye Make-Up Remover Pads are tough on mascara (even waterproof mascara) while still being gentle on your lashes and eyes. They are even suitable for contact lens wearers with our dermatologically and ophthalmological tested formula. First impression, it takes a little work for these pads to actually remove mascara. Other eye make-up comes off easy enough, but mascara takes more work. I wasn’t even using waterproof mascara. I have no idea how it would work on a waterproof formula. For heavier make-up application, you will probably need more than 1 pad to fully remove darker traces around your eyes. On the plus side, it doesn’t sting the eyes. It smells pleasant, not overly perfumed, just sort of fresh. I did see some eyelash loss with this, but this happens with everything other than Klorane, which I just ADORED. Here is that review. Would I purchase this? I think this will work well for travel and camping. For home yes, I would like to try the other formula Simple has, in a bottle. Have you tried the Simple eye make-up remover or other products? This is what I carry with me everyday. Sephora Kabuki Brush. It’s retractable and perfect for the purse. I got this on clearance last year and it’s now gone from the site. This is the closest I could find for the price. Starlooks Kohl Liner in Obsidian. Still available and only $9.00 USD. Revlon ColorBurst in Fliratious Charmeuse $12.88 USD. I love that this doubles as a lip balm. It’s so soft. Sephora + Pantone Universe Collection lipstick in Pure Marsala. This was a limited edition color last year and I went bonkers over it. There are still items left over in that shade on Sephora’s website. It’s a red brown shade, and I’m still a little obsessed with it. Clinique Almost Lipstick in Black Honey $17 USD. This is one of my favorite make-up items of all tume. Blotterazi by beautyblender. This was a Birchbox sample because I don’t know I would actually purchase this. It’s $20.00 USD and it’s supposed to be an alternative to blotting. But, if it really worked would I still be carrying around my MAC Mineralize? Hope you lovelies enjoyed what is in my purse!